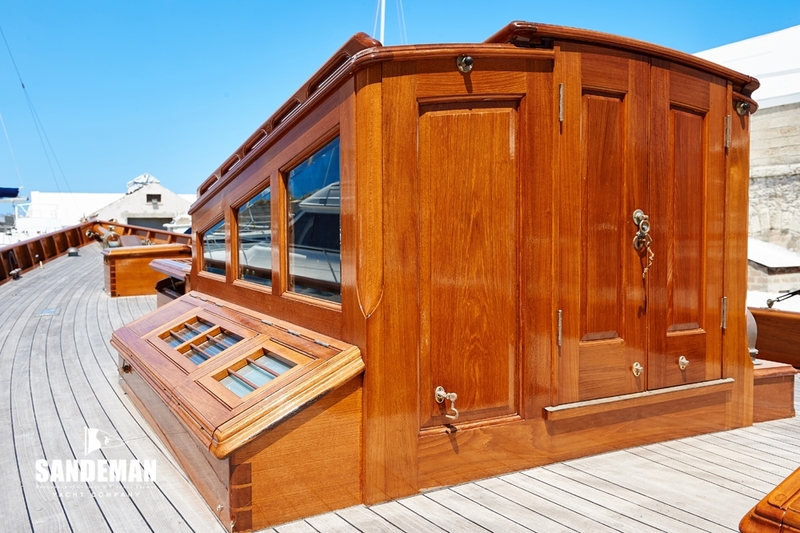 Designed by Scottish legend Alfred Mylne and built in 1926 by A.M. Dickie and Sons, CHICANE’s beauty and sailing qualities have kept her in a one family ownership since 1958 and moreover inspiring them to commit to her restoration. 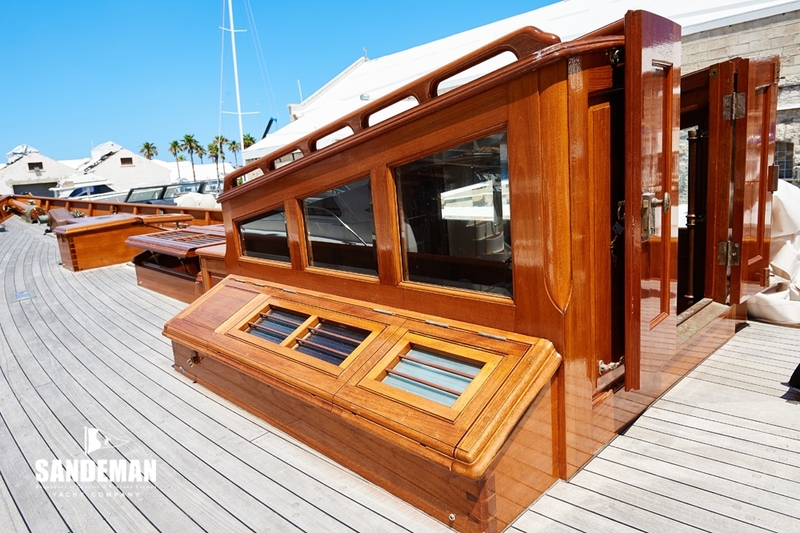 Of the quality of this there have been very few comparable in the classic yacht arena - indeed the names of those contributing read like a who’s who of experts in this field and their achievement is a boat you could not build for three times the listing price. 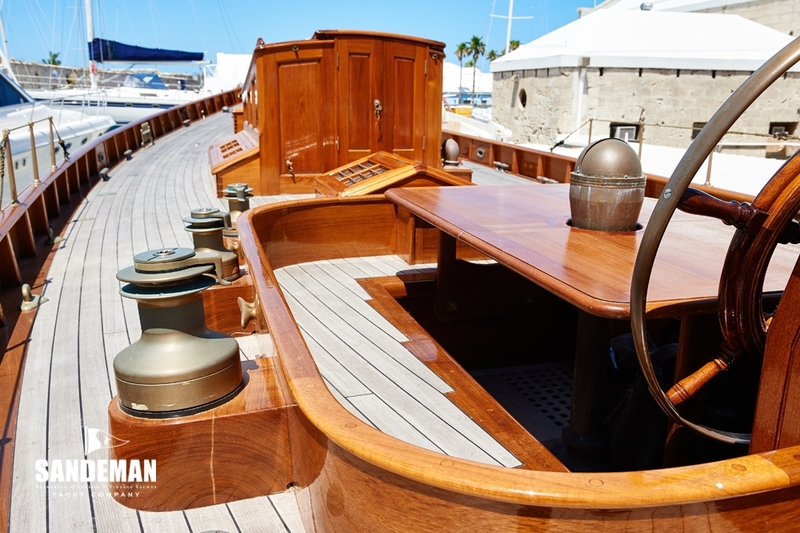 The late Olin Stephens considered the CHICANE restoration the finest he had ever seen and some of the most respected shipwrights have likewise been left spellbound by it. 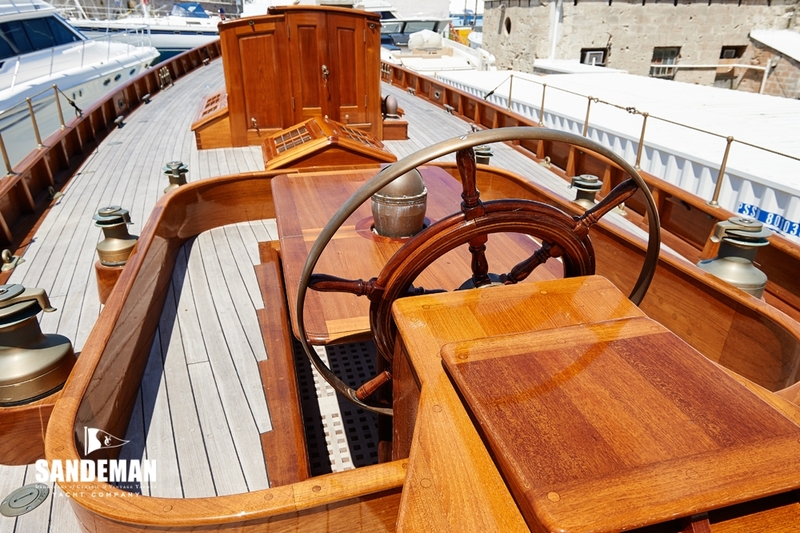 A masterpiece therefore but at 56 feet on deck CHICANE is a useful size, practical and an awesome sailing boat waiting for the next chapter. 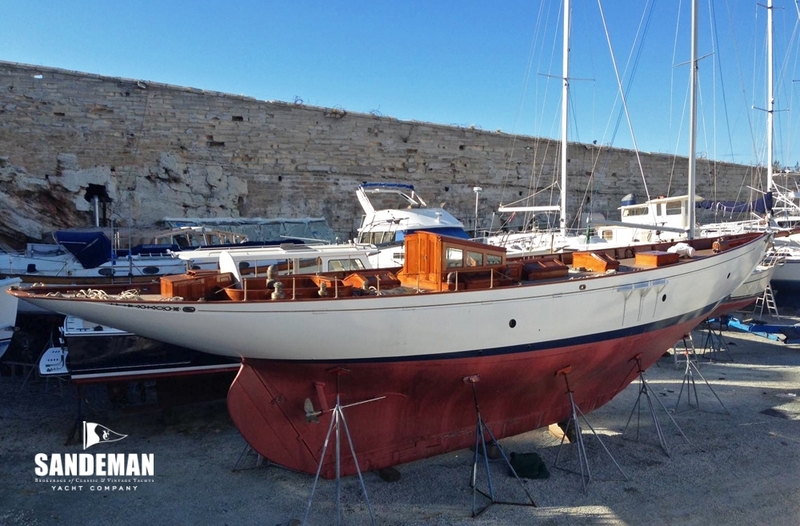 Early history is still being researched but Peter Nicholson once told her current owner he remembers CHICANE at moorings on the Solent from his boyhood years. 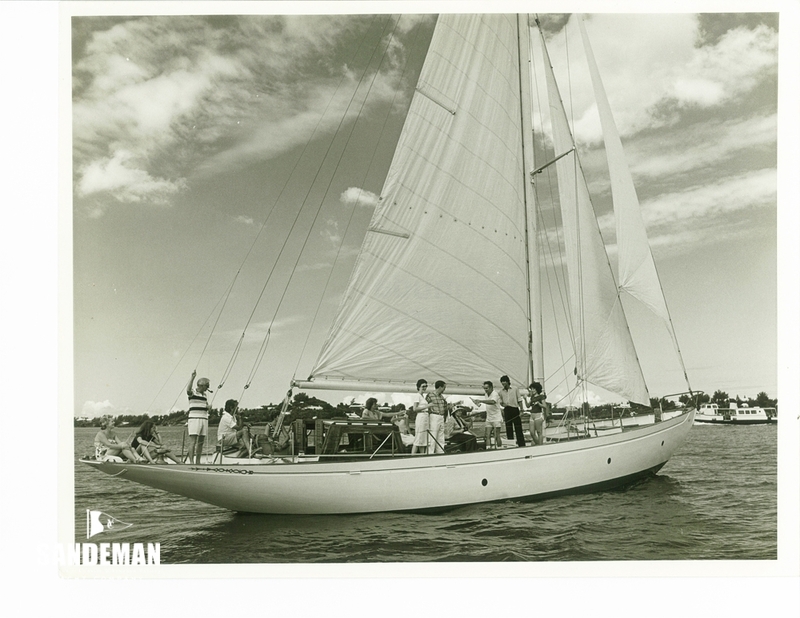 There are numerous Beken photographs recording CHICANE's history pictorially, one of which in 1934 shows her original gaff rig while another in 1948 has her sporting a Bermudan rig. 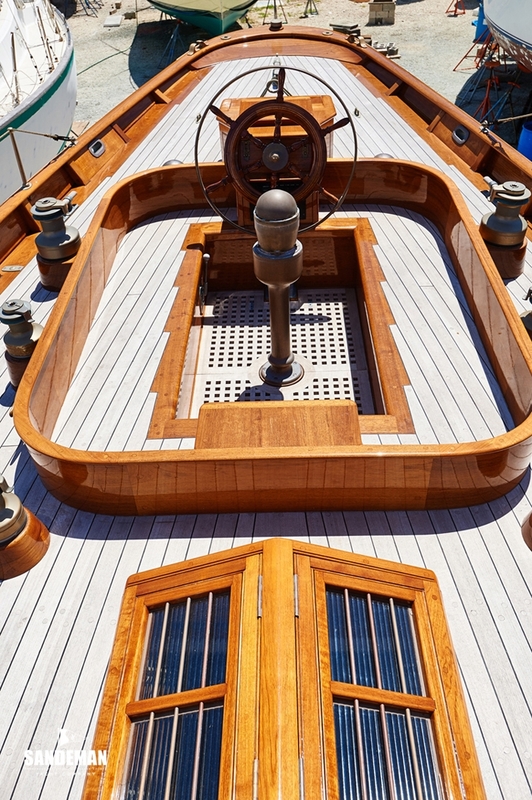 Throughout she has remained a cutter with elegant bowsprit and three lofty headsails. 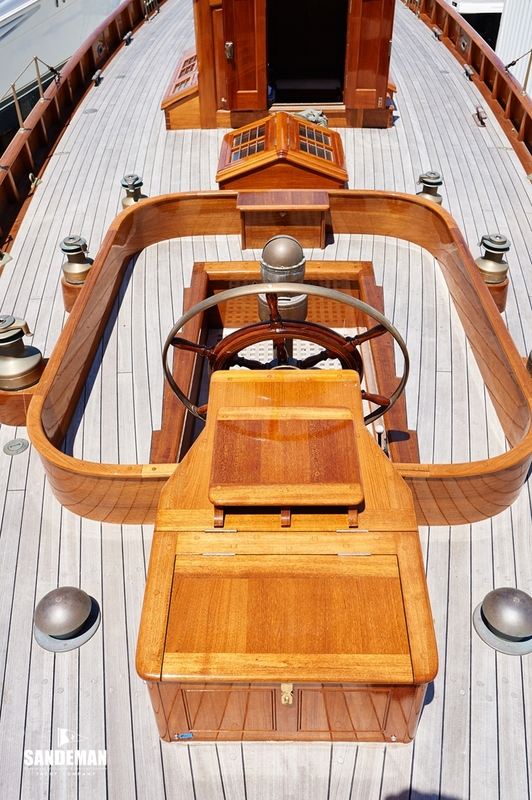 In the 1950s CHICANE underwent several radical changes. 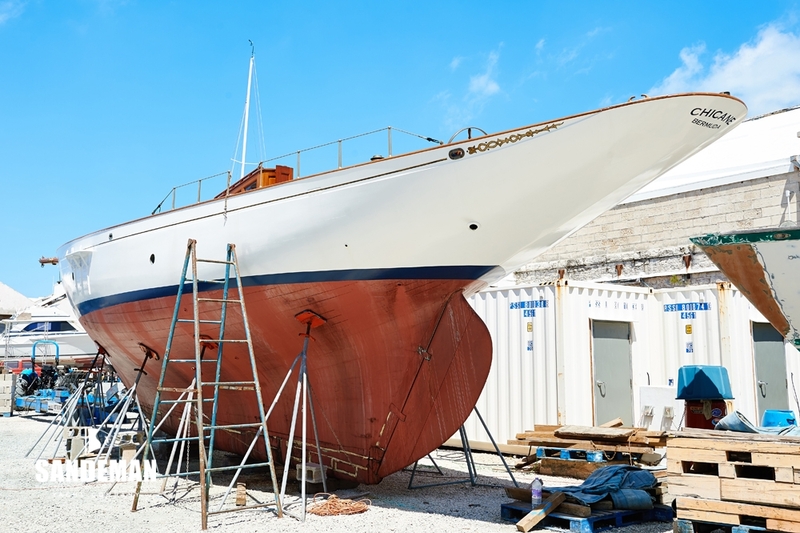 Her bowsprit was removed and boom shortened. 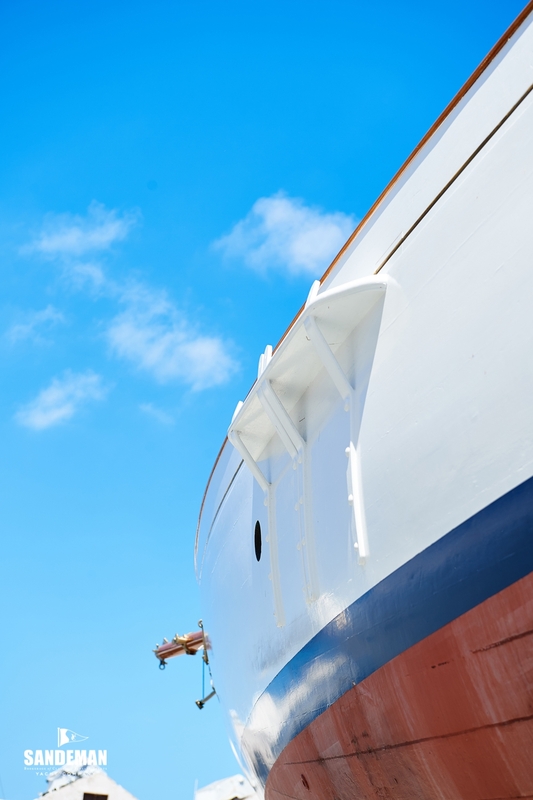 Her doghouse was moved aft and lowered in profile. 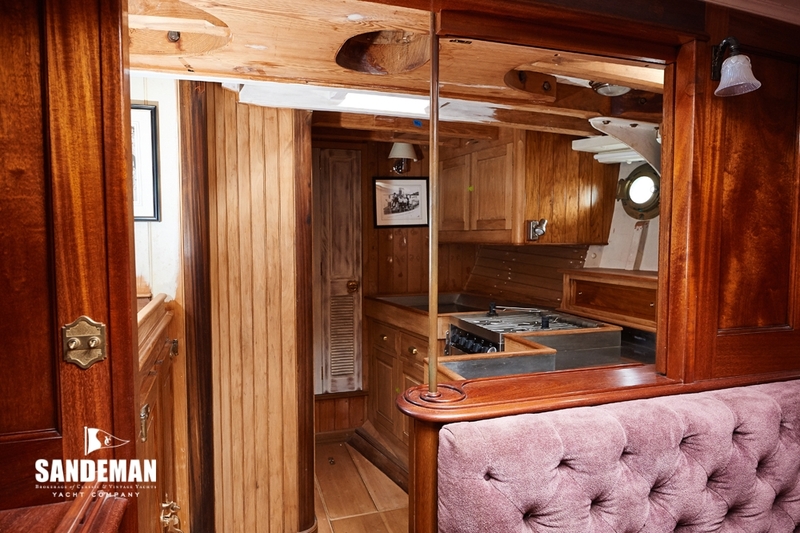 That not only removed a signature Mylne feature but effectively cut the cockpit in half. 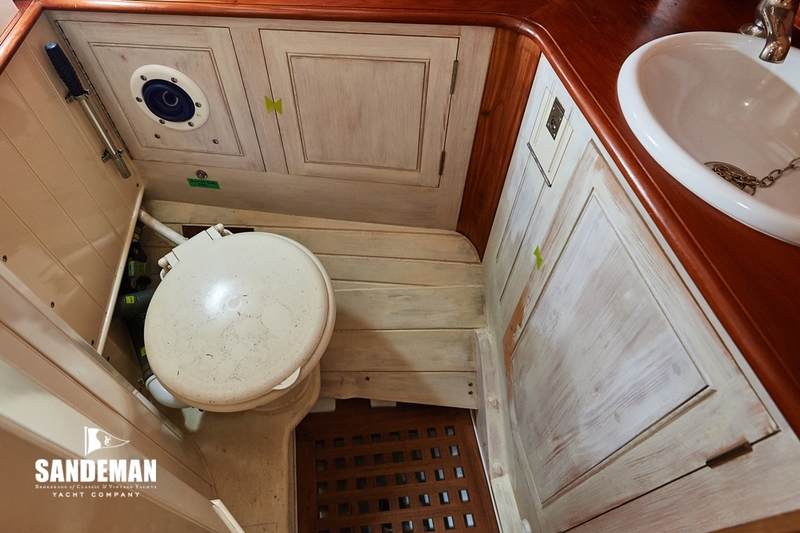 Moreover as all access below was that way any privacy of the owner's aft cabin was lost. 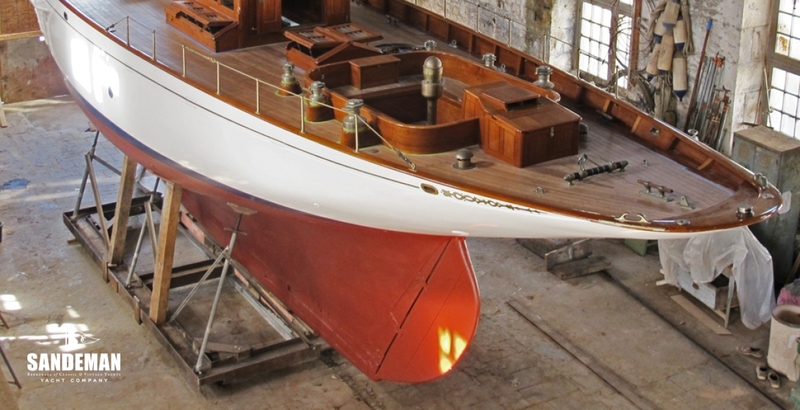 Notwithstanding she was still a beauty to behold - and during her subsequent restoration and rebuild all these changes were put right. 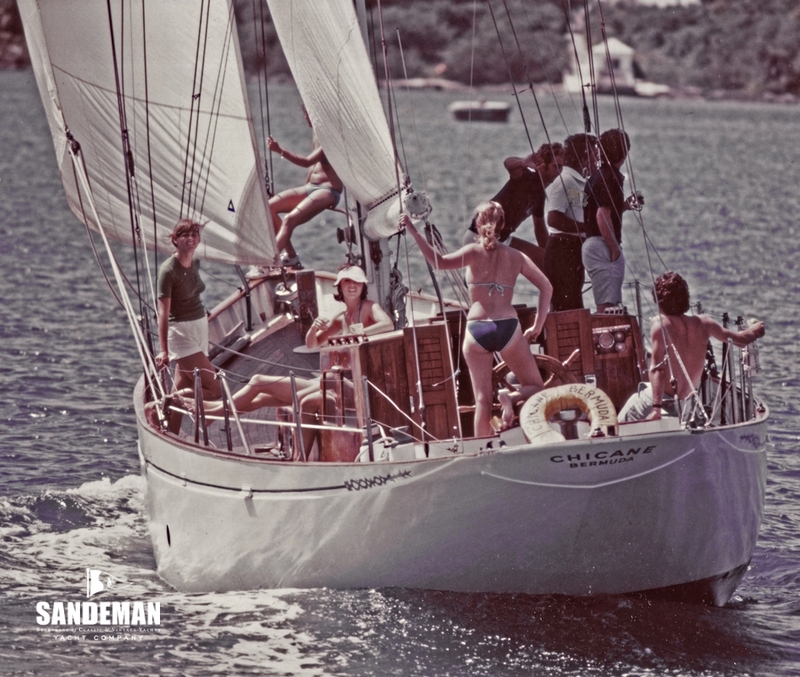 In 1958 William Kempe sailed CHICANE to Bermuda, where she has remained ever since. 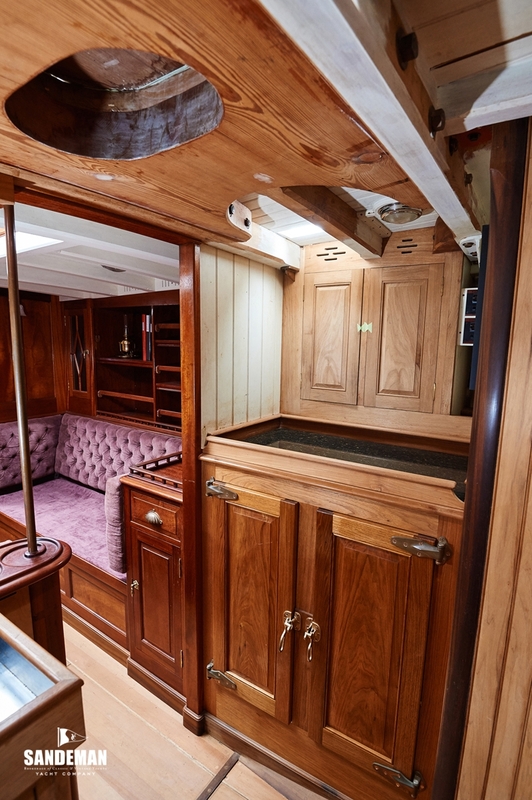 His nephew Reid bought her in 1975, proudly carrying his new bride Lucia aboard over the gunwales in 1976 – to live aboard for their 1st year together - so CHICANE has remained there with only 2 owners now for well over half a century. 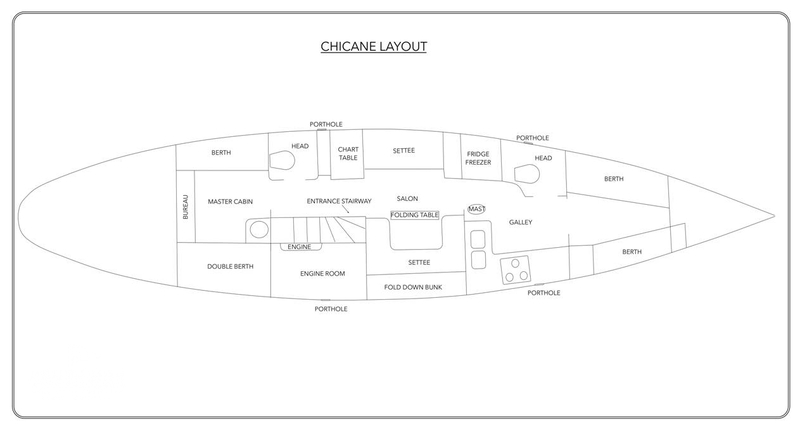 CHICANE has recently undergone a full restoration information on which is provided below. 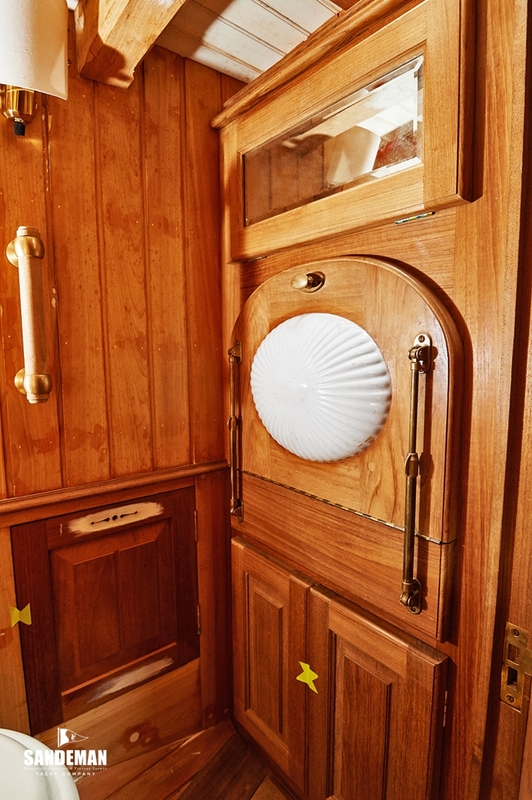 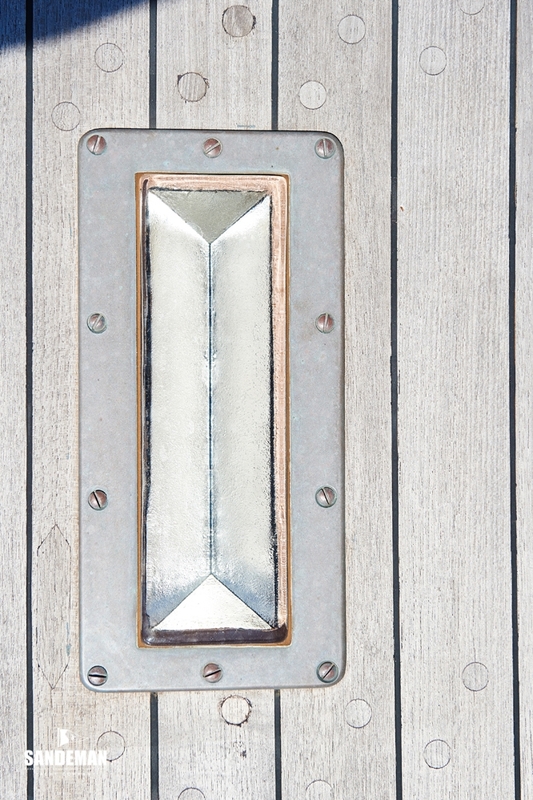 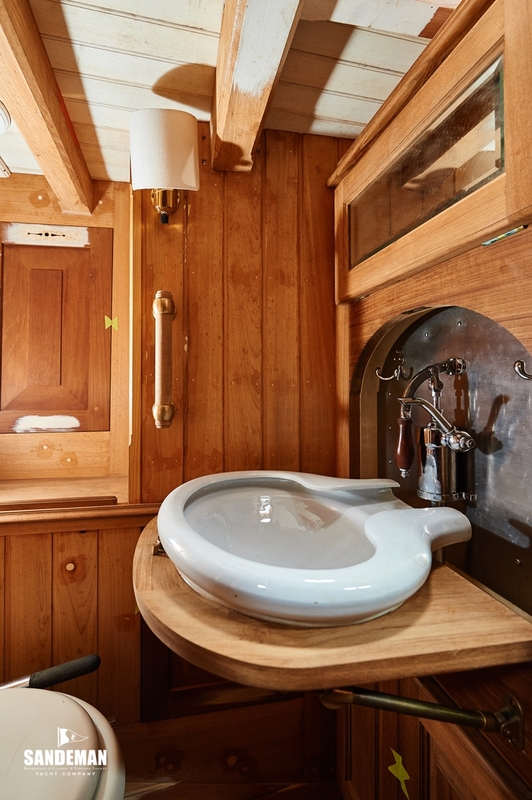 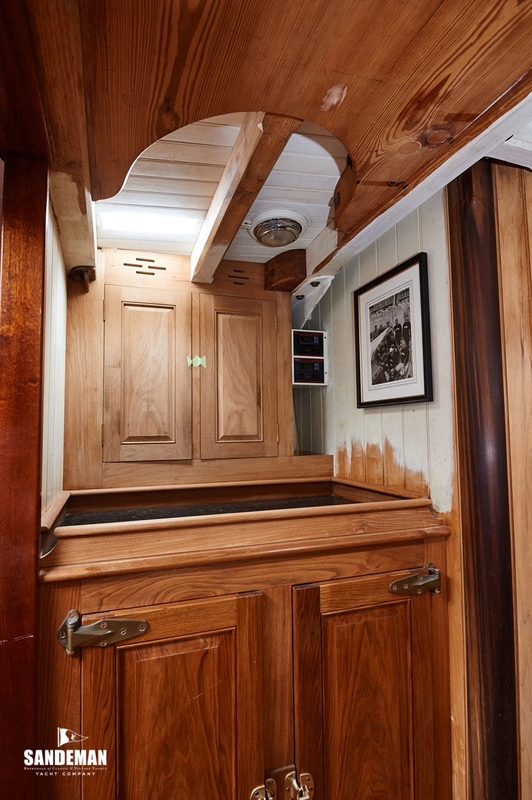 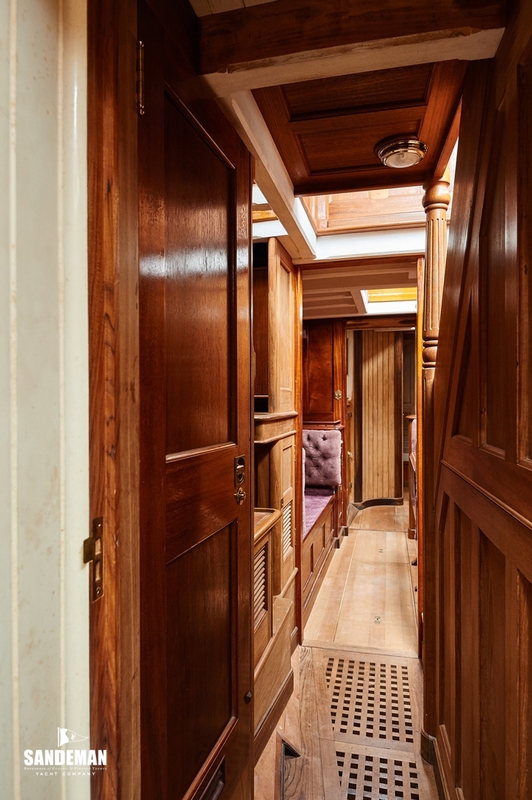 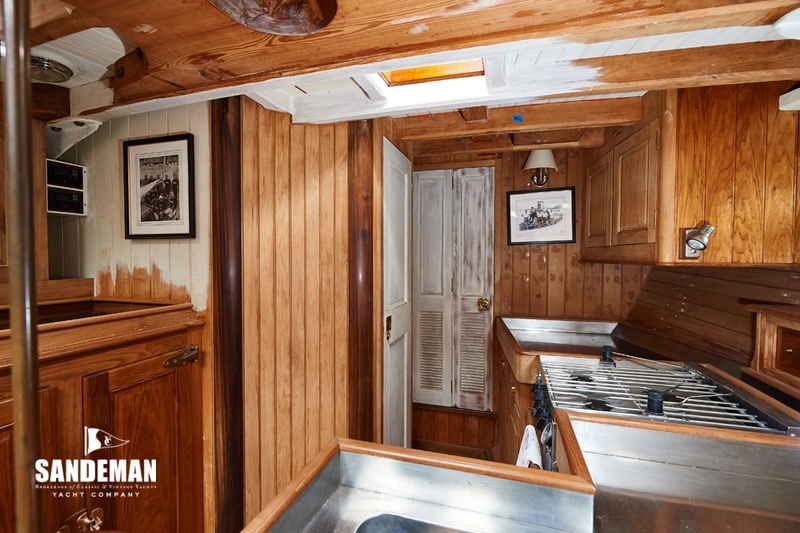 There are seven sections of the yacht each with their own unique moulded panelling. 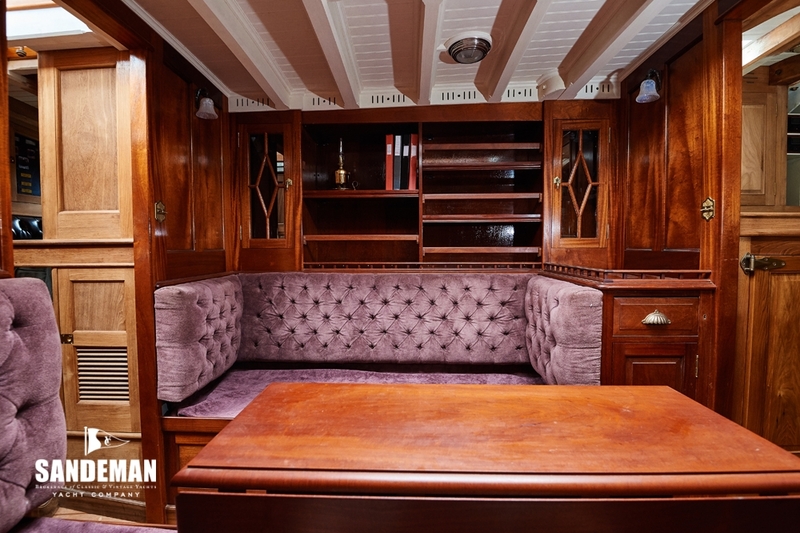 The joinery and furniture is of the highest quality and true to period. 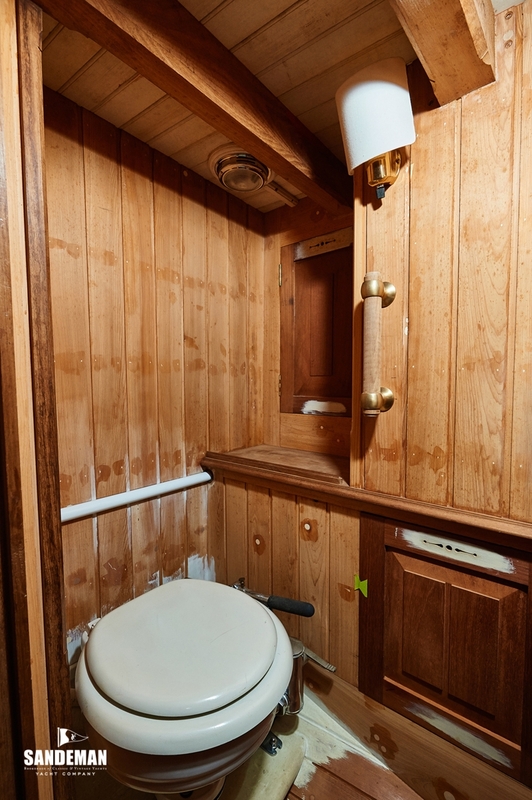 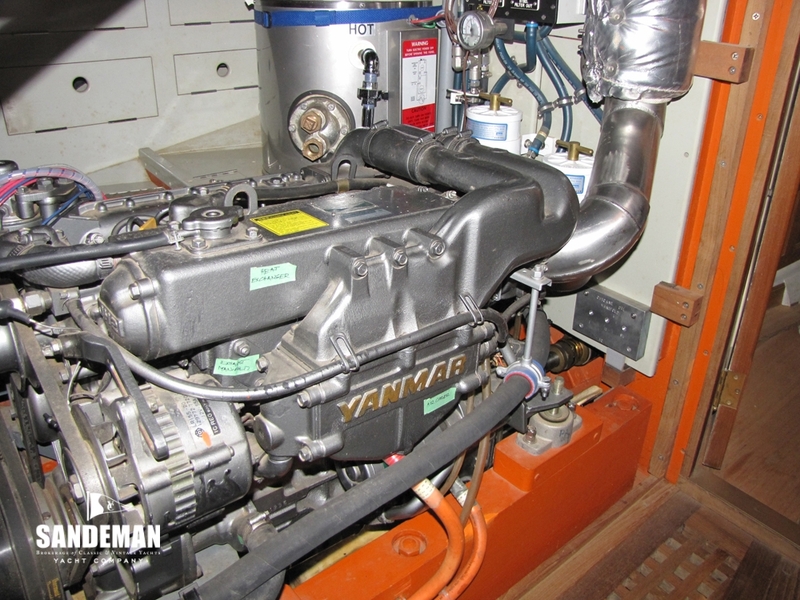 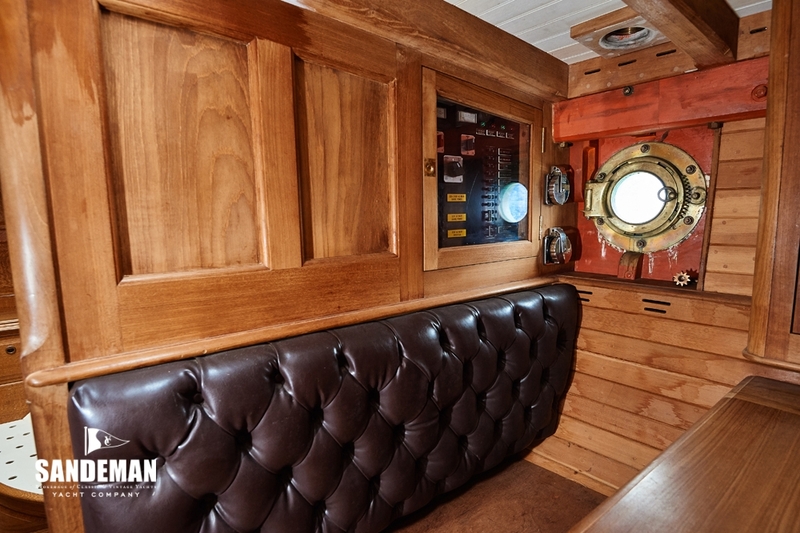 Ventilation is provided by windows, hatches, companionways and deck cowlings. 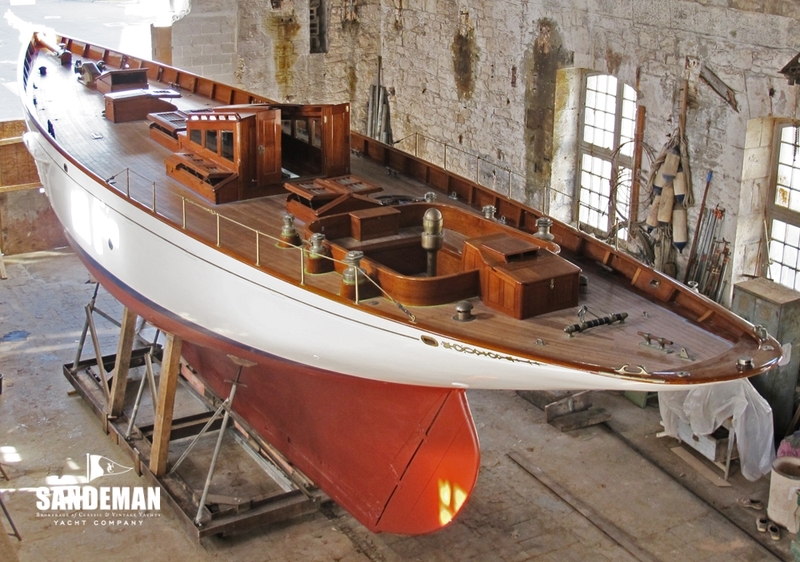 CHICANE has been lovingly restored - principally by shipwrights Joe Postich and Wendy Bliss, themselves alumni of the first Apprenticeshop in Bath, Maine, brainchild of the legendary Lance Lee. 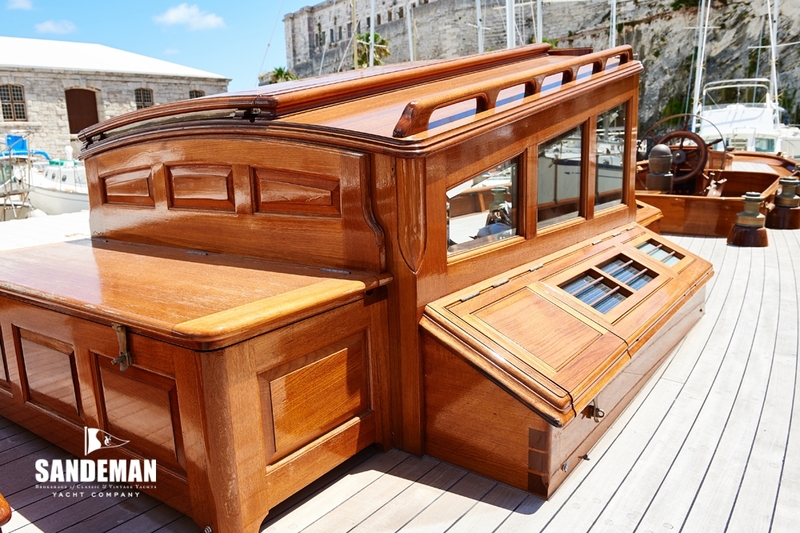 One of the first ‘woodenboat’ institutions the Apprenticeshop led the wooden boat renaissance in the US if not World wide. 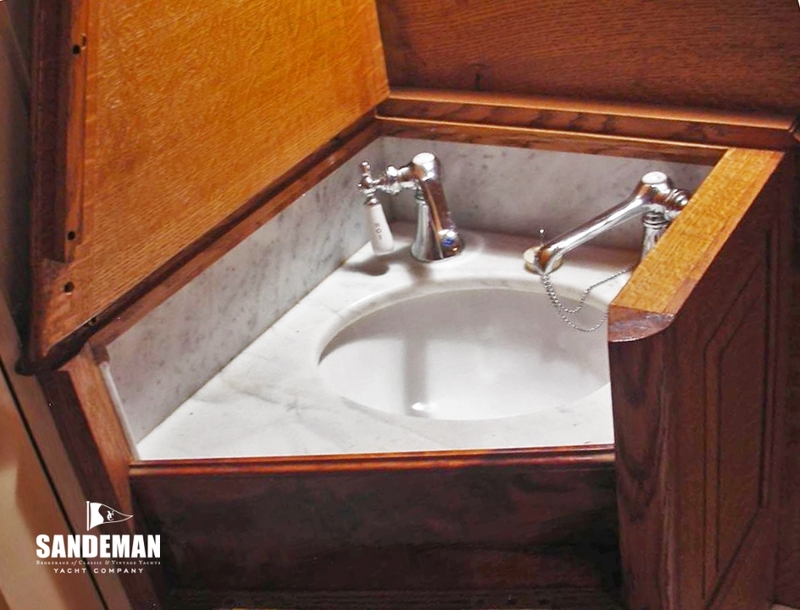 Methods and materials have been traditional with the use of modern materials when appropriate. 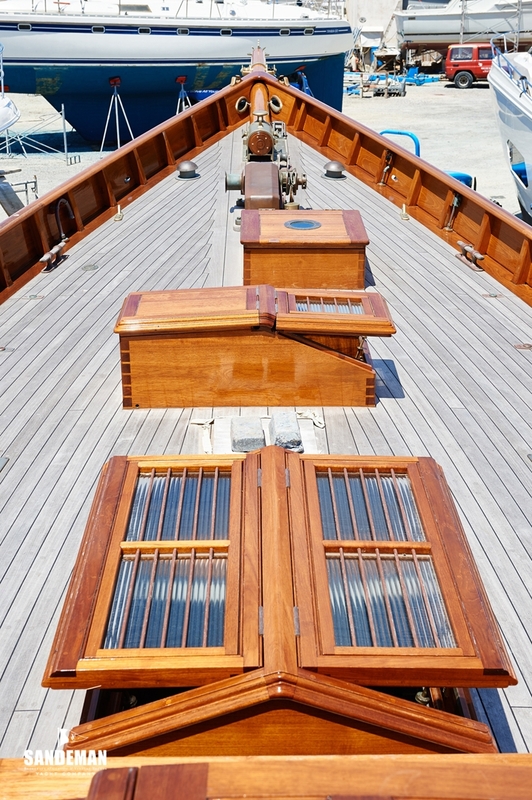 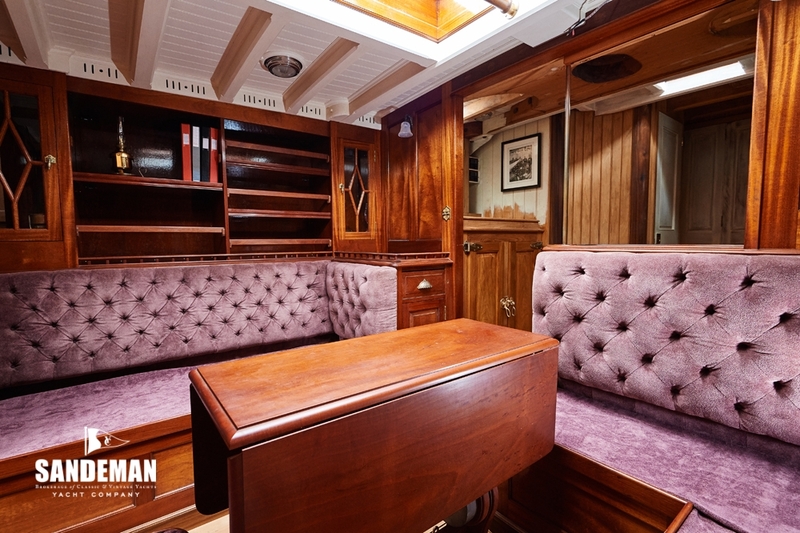 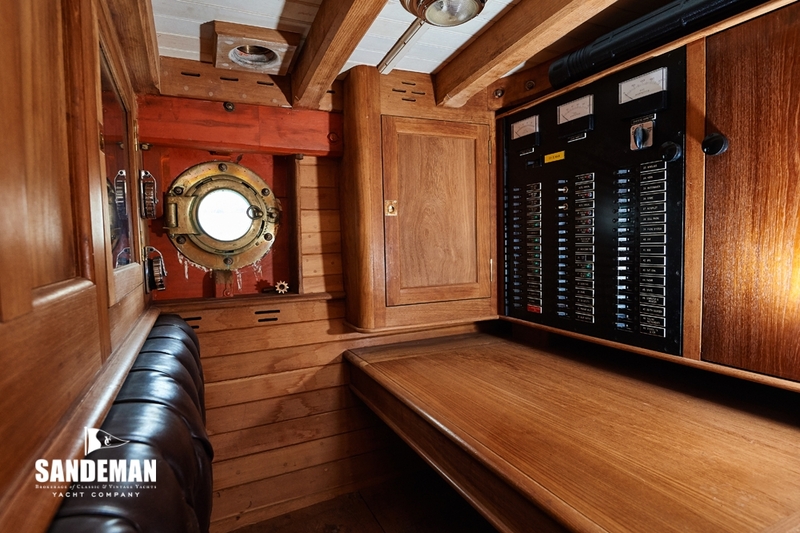 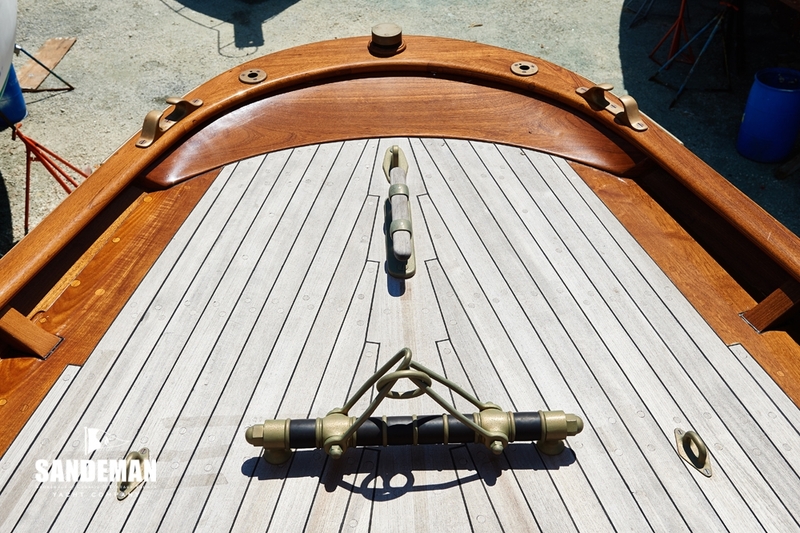 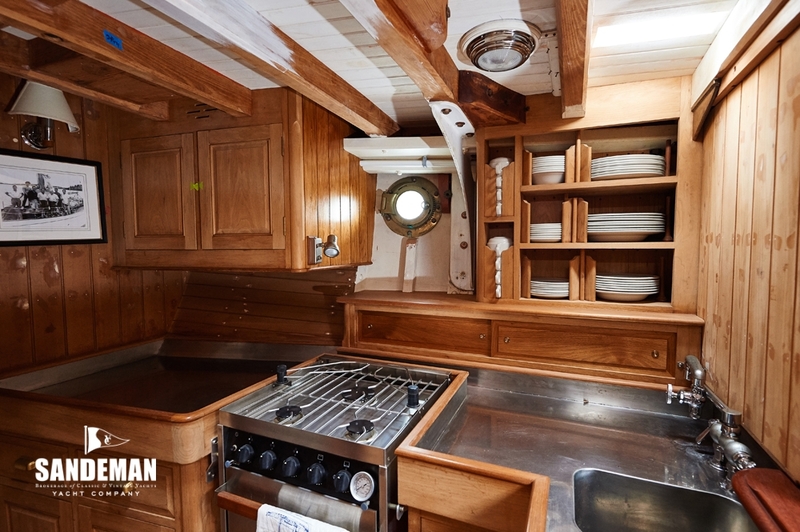 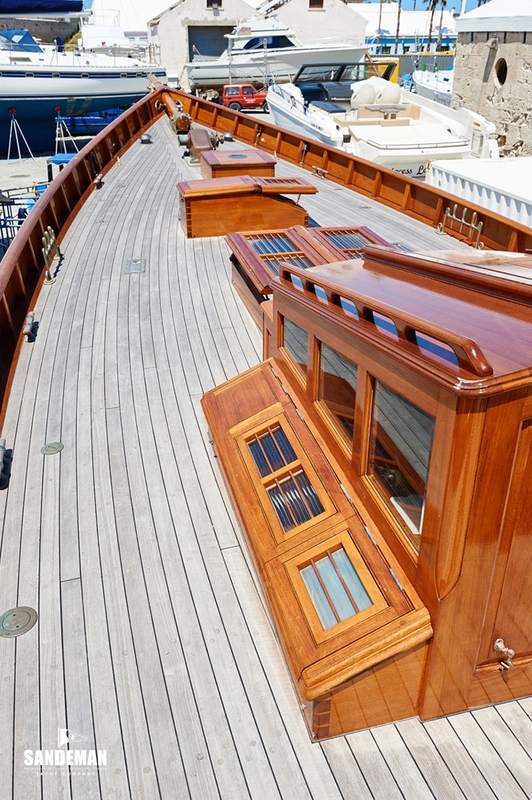 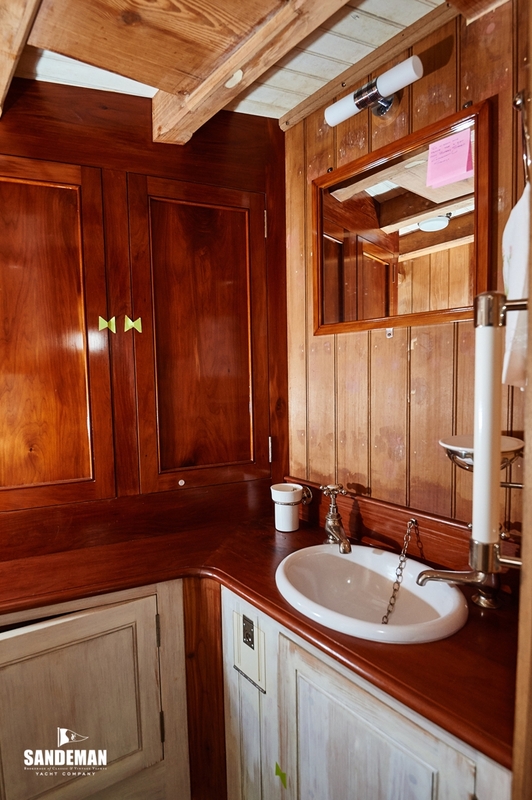 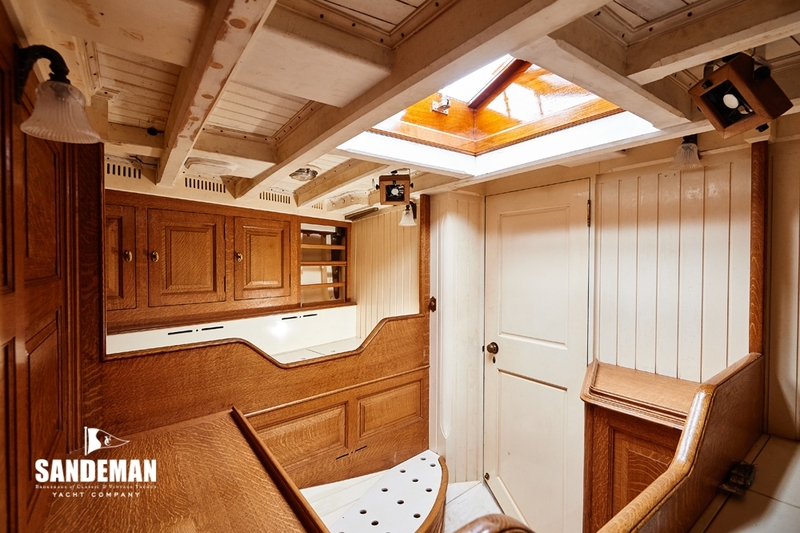 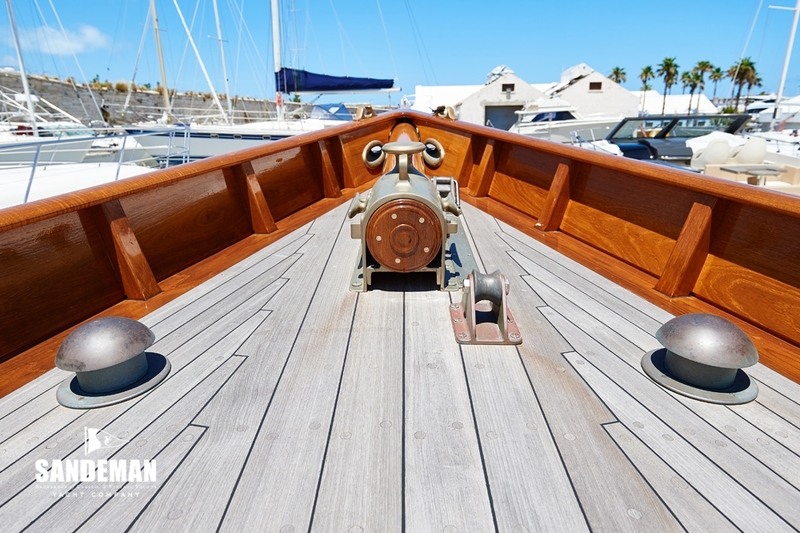 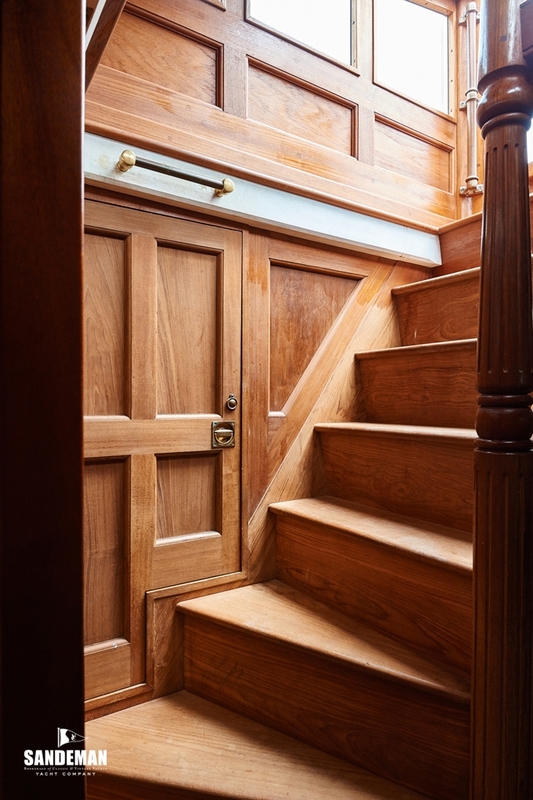 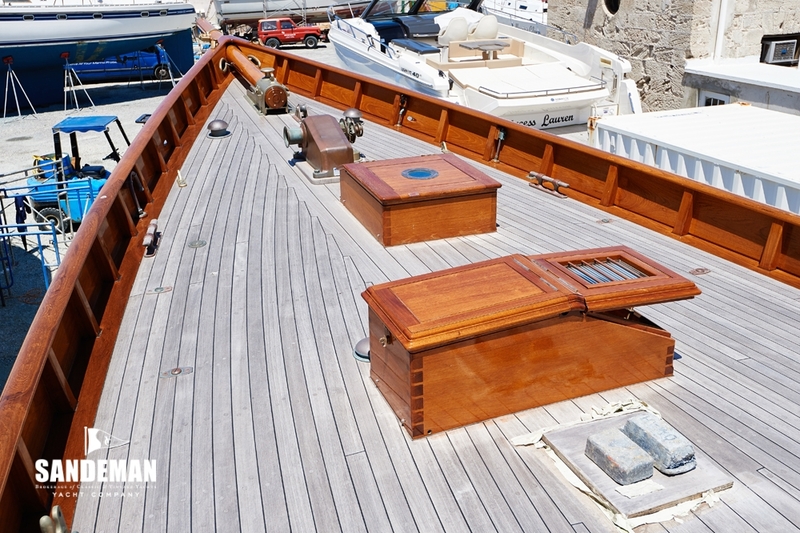 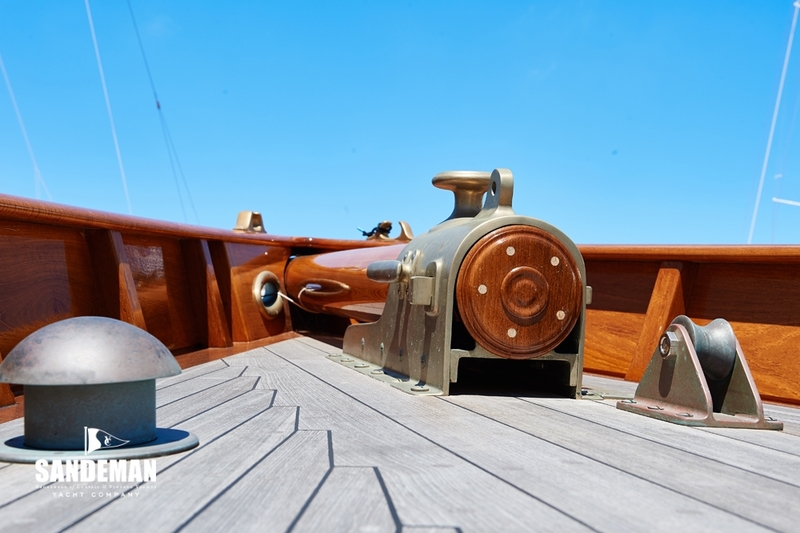 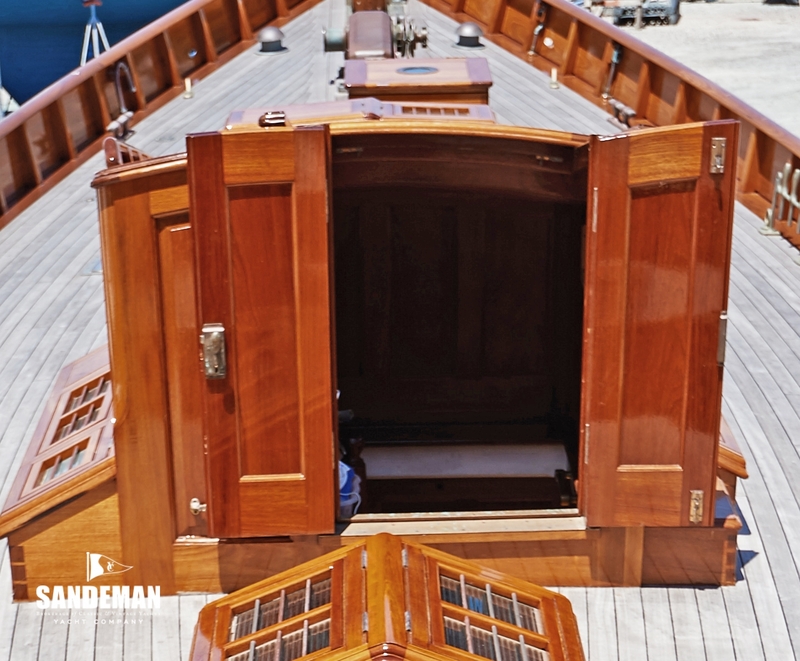 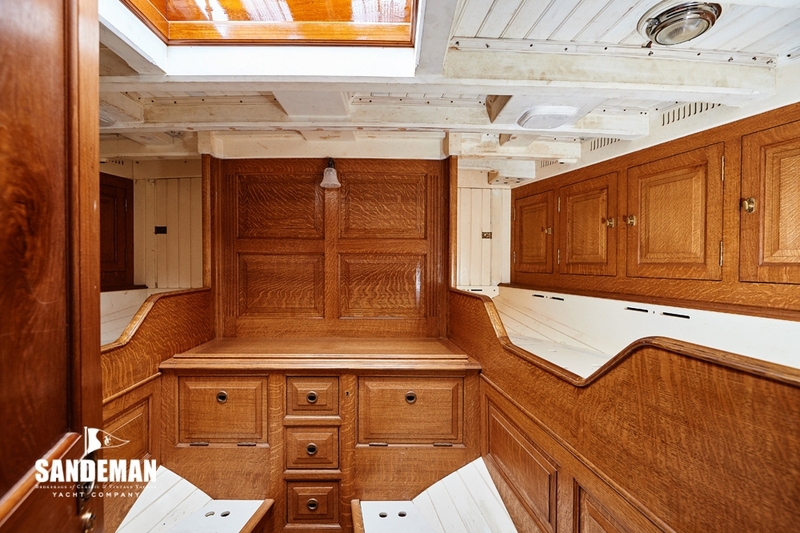 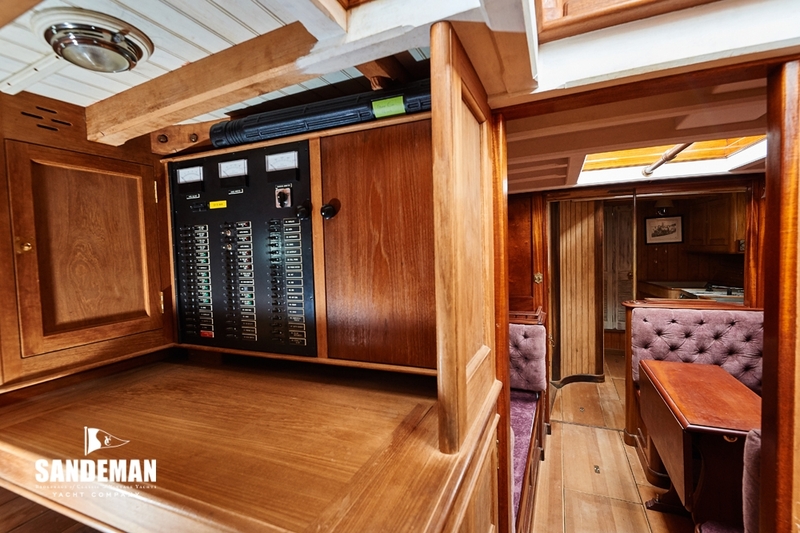 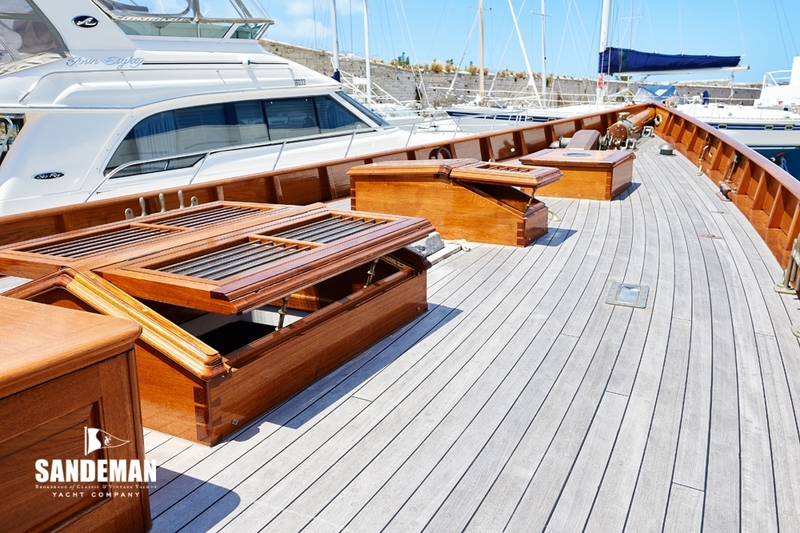 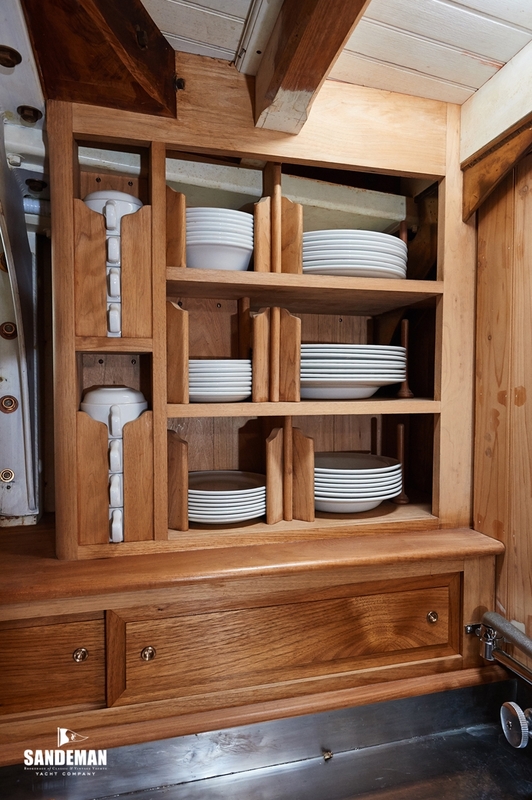 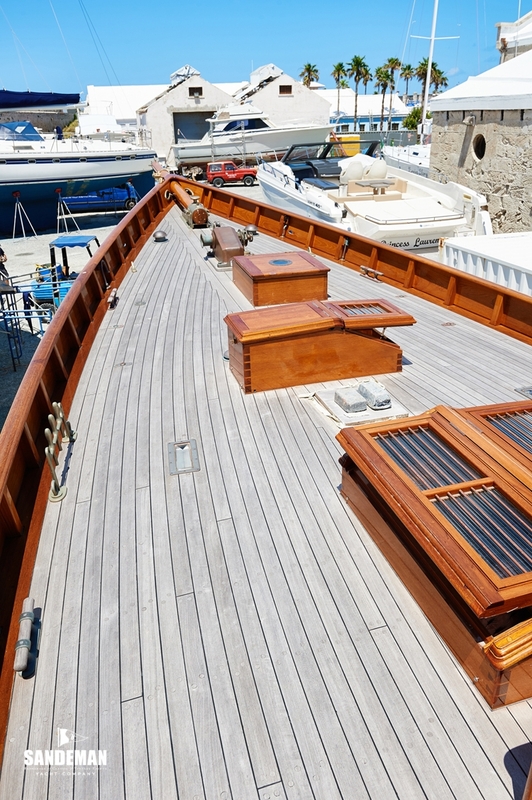 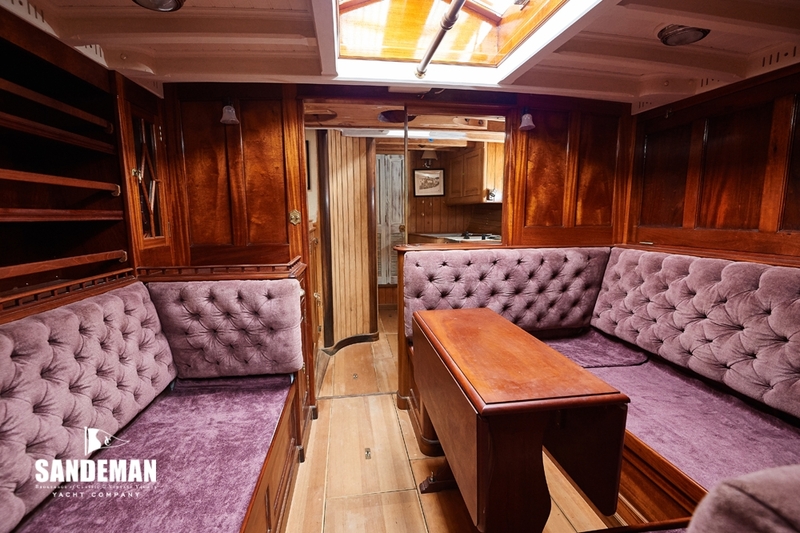 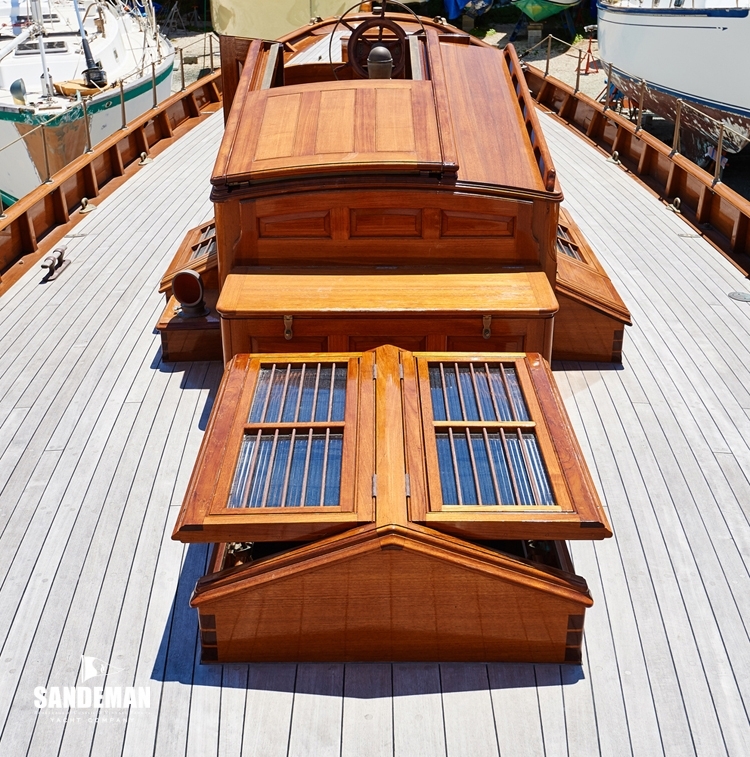 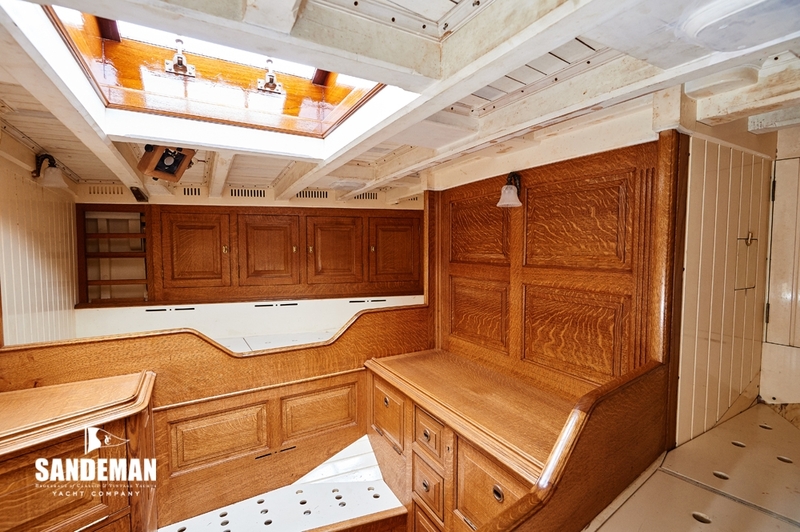 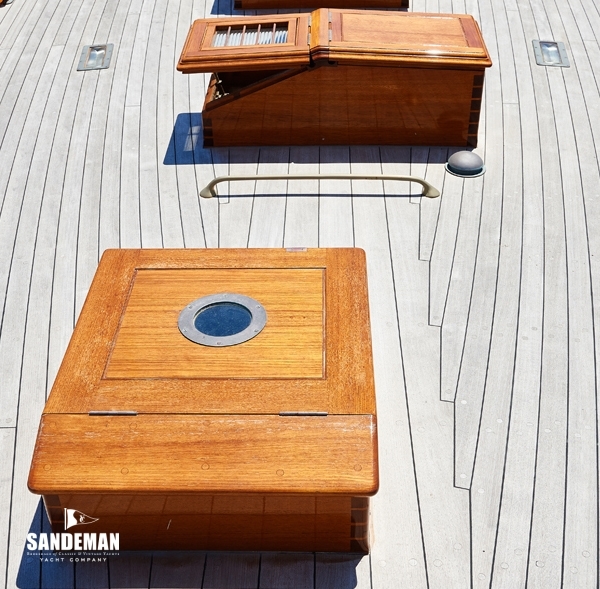 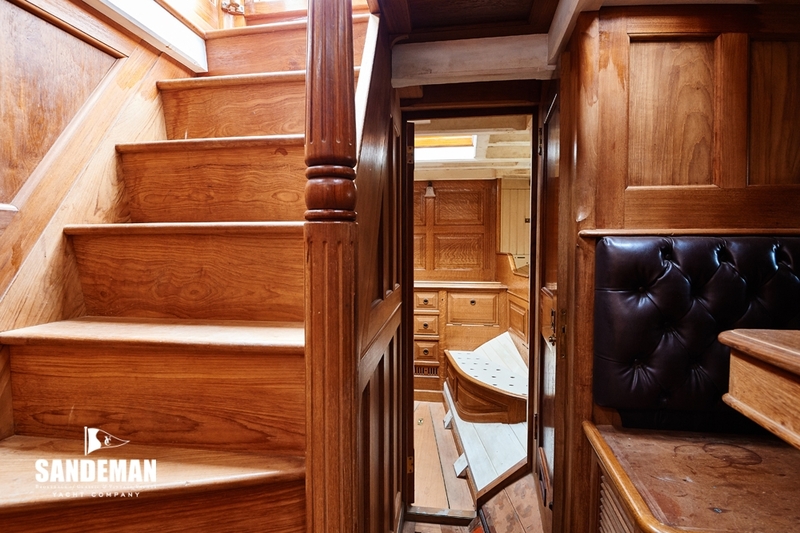 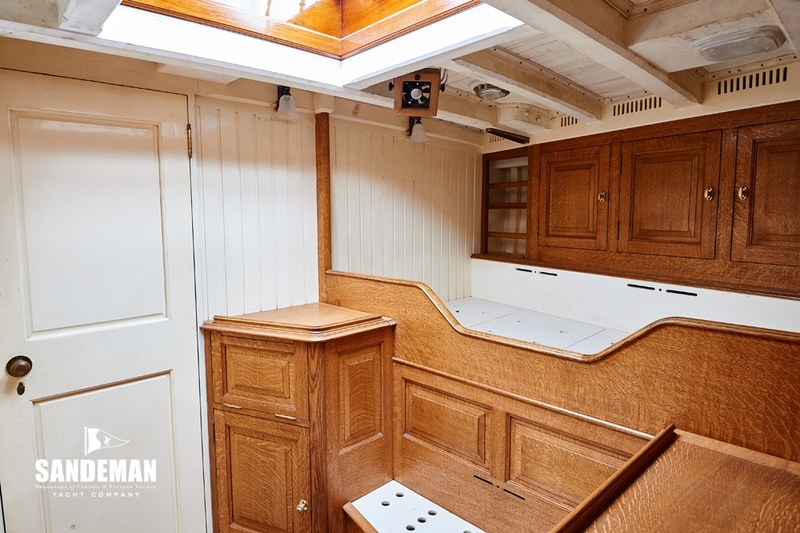 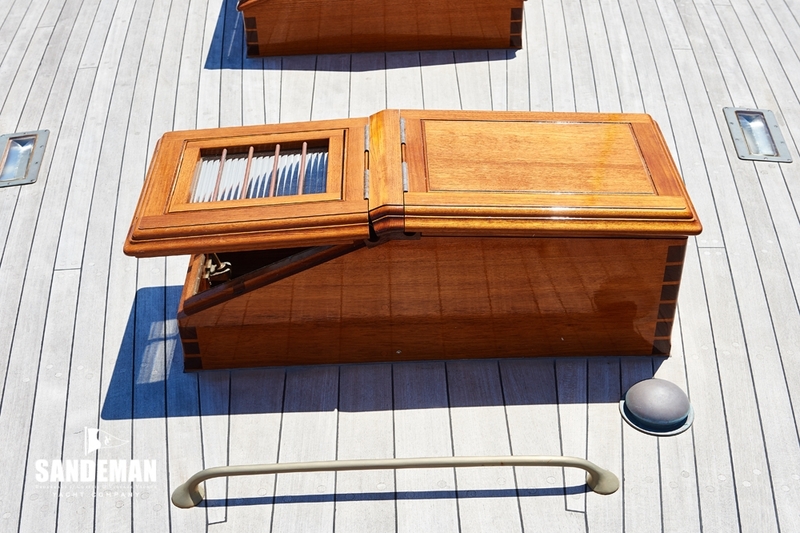 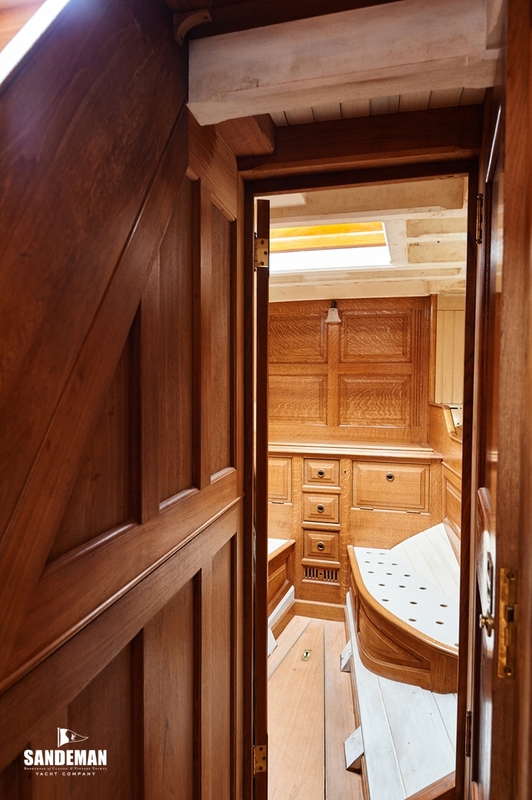 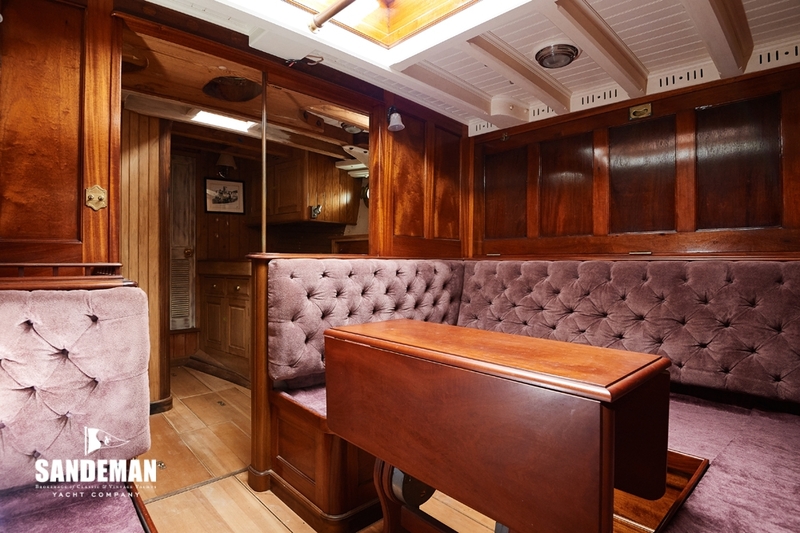 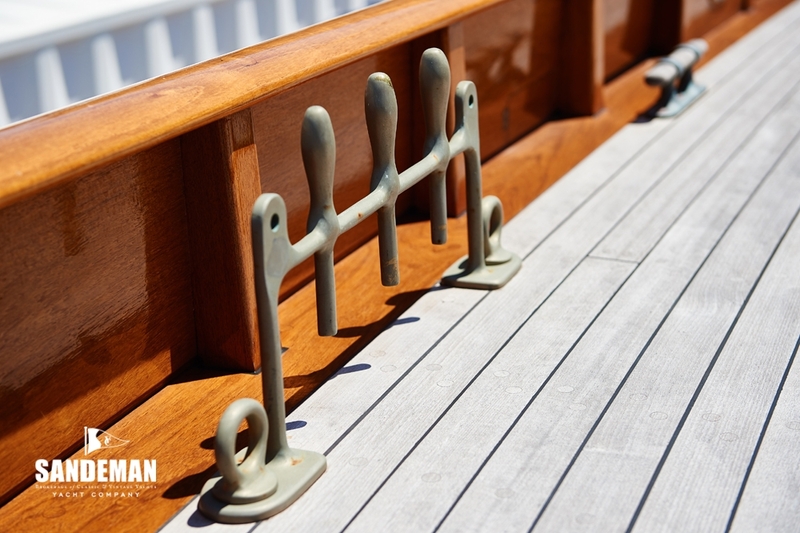 The work has involved tens of thousands of silicon bronze fastenings, thousands of feet of cotton and oakum caulking and a traditional laid teak sprung deck. 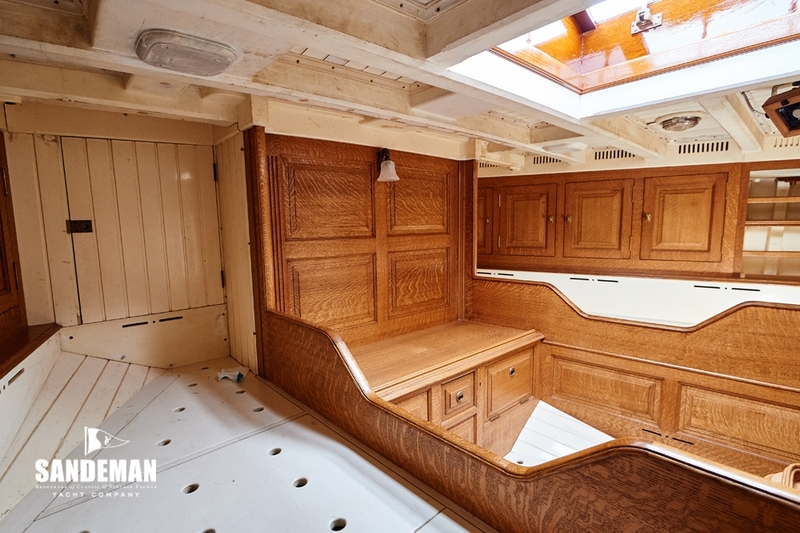 The process has effectively renewed most of the yacht. 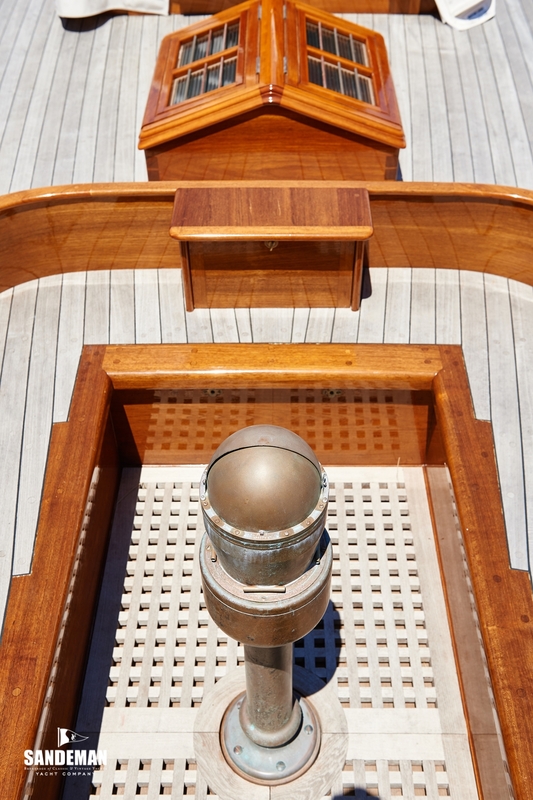 What remains of the original is essentially her shell; half the stem, keel, the stern post and all of the original Burmese teak planking. 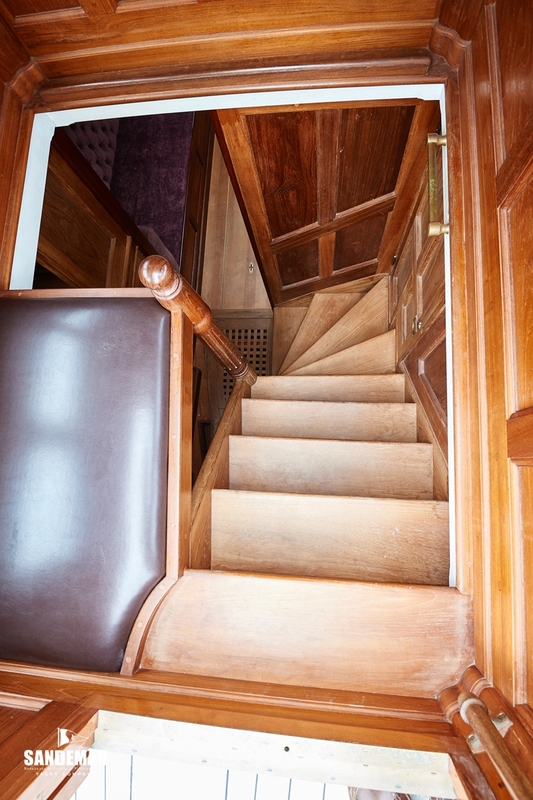 The planks were left in place during the re-build with frames being renewed from the inside. 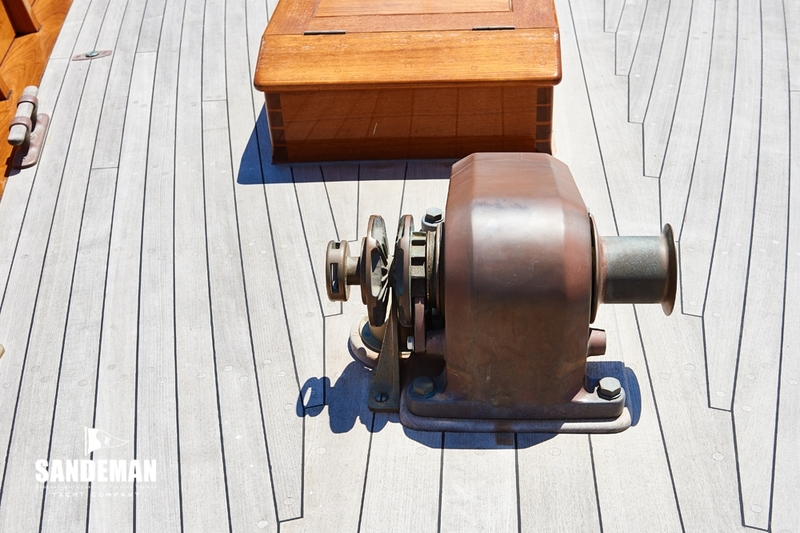 All the rest is new. 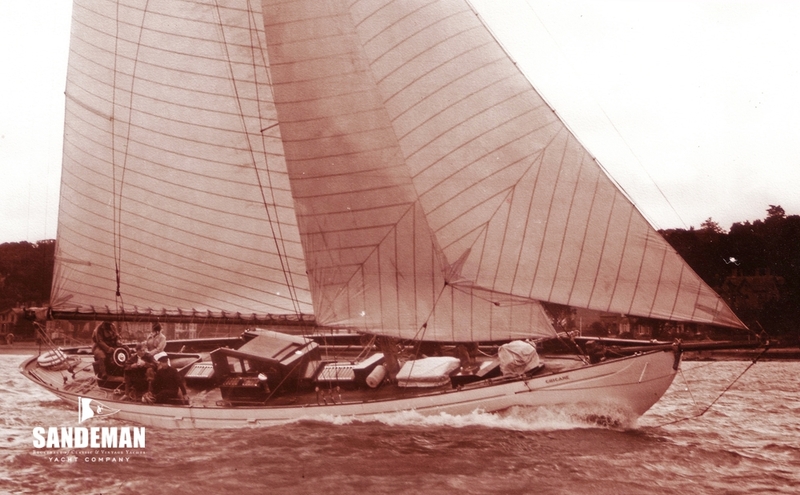 The rig and sailing gear have been designed with the combined efforts of Tom Cunliffe, Paul Goss and Don Costanzo using the original rig drawings by Alfred Mylne. 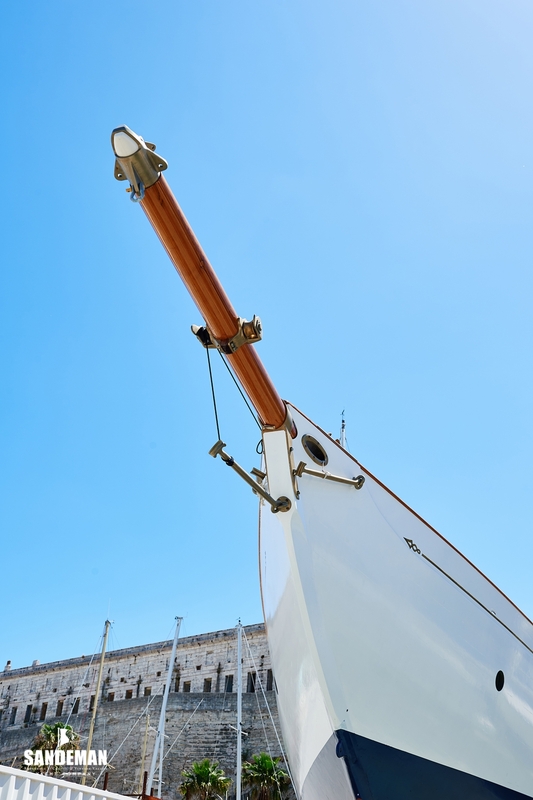 Reverting to the original rig requires a taller mast, which has not yet been completed. 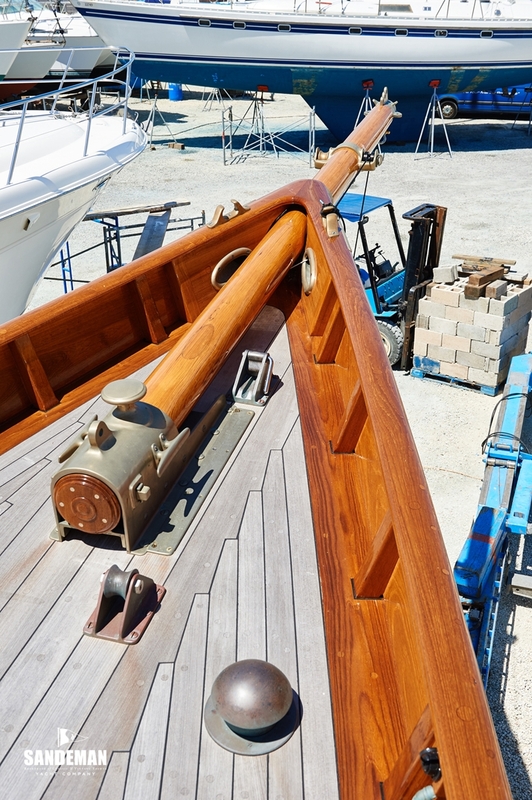 The bowsprit however has been and is a thing of beauty. 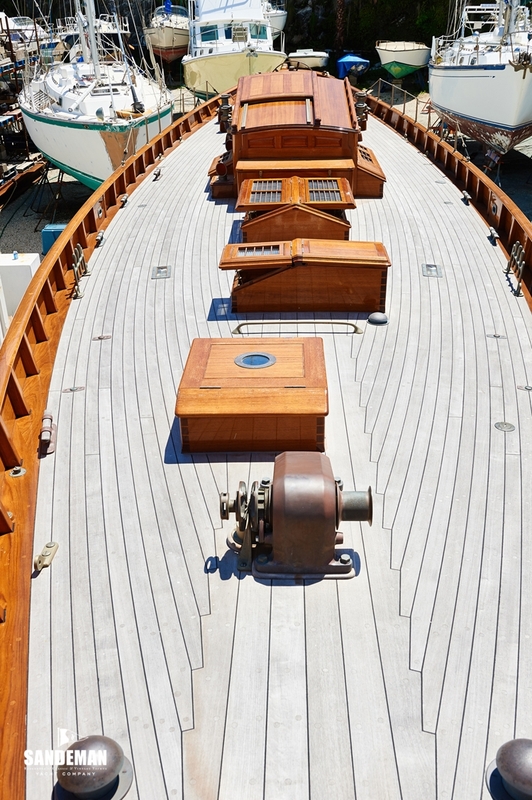 All bronze bowsprit and rig fittings were designed and manufactured by the late Harry Spencer – the last job he did before he died. 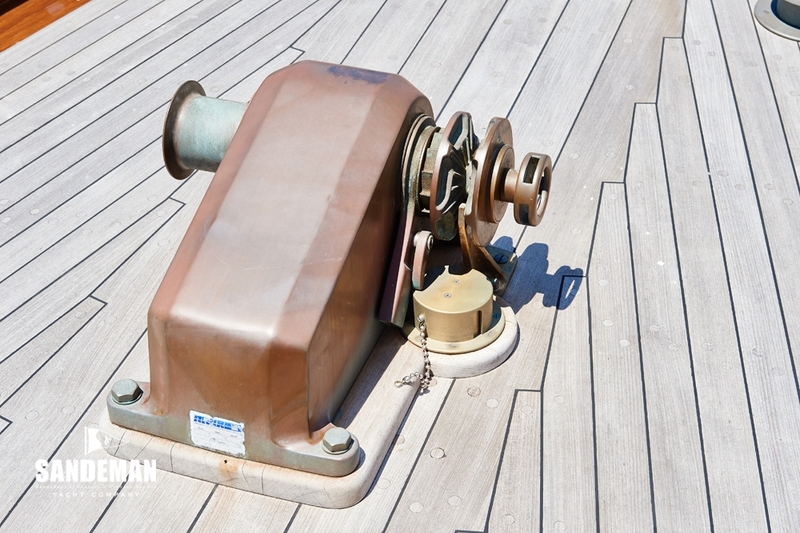 All systems are of the highest quality and are worthy of particular mention. 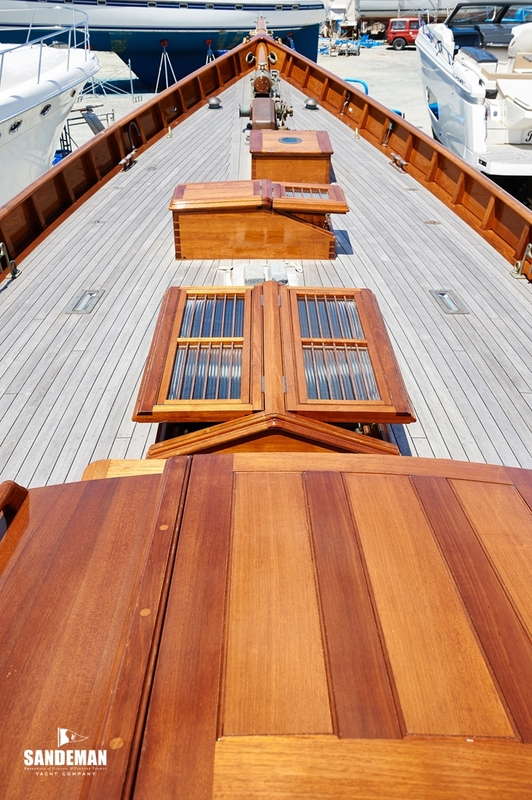 Electrical systems are often problematic or not substantial enough – not so in this case. 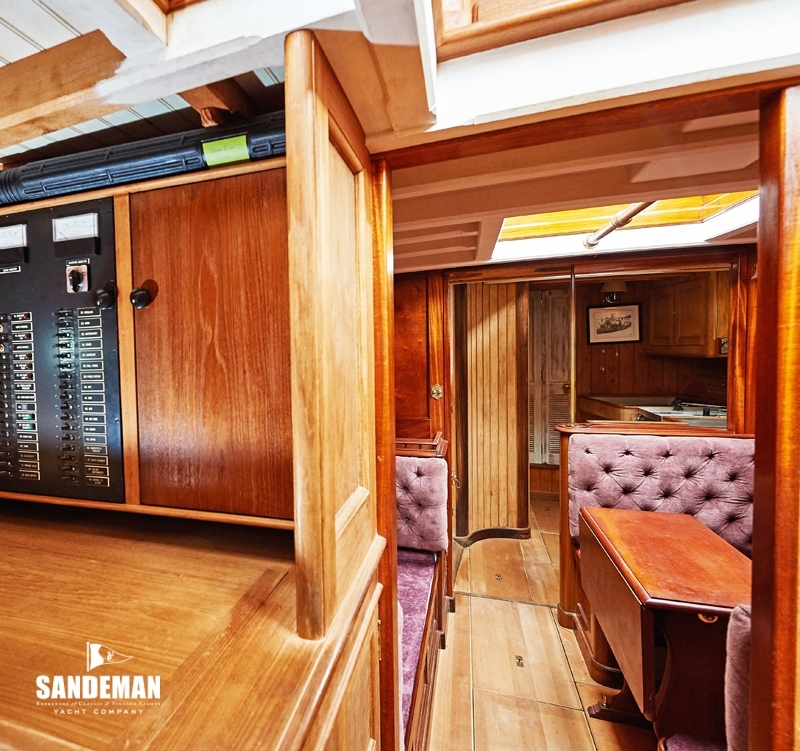 Wendy Bliss who worked alongside Luther Goff designer of the entire electrical system, has written up detailed manuals of the system; the quality of which has impressed visiting boat owners and builders alike. 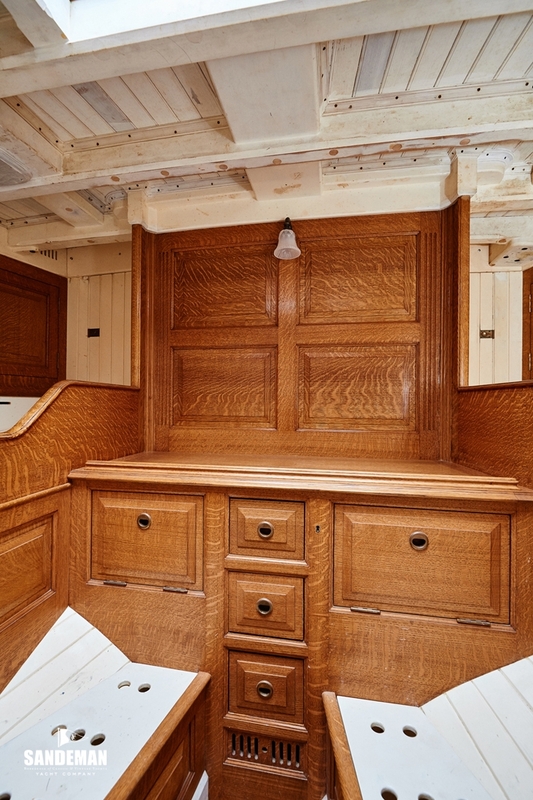 While the skill, dedication and aesthetic sense of shipwrights Joe and Wendy have been key to the quality and authenticity of this restoration, early advice and expertise was forthcoming from Ian Nicolson and David Ryder-Turner of A. Mylne and Company and Gordon Swift and Giffy Full also of Woodenboat School fame. 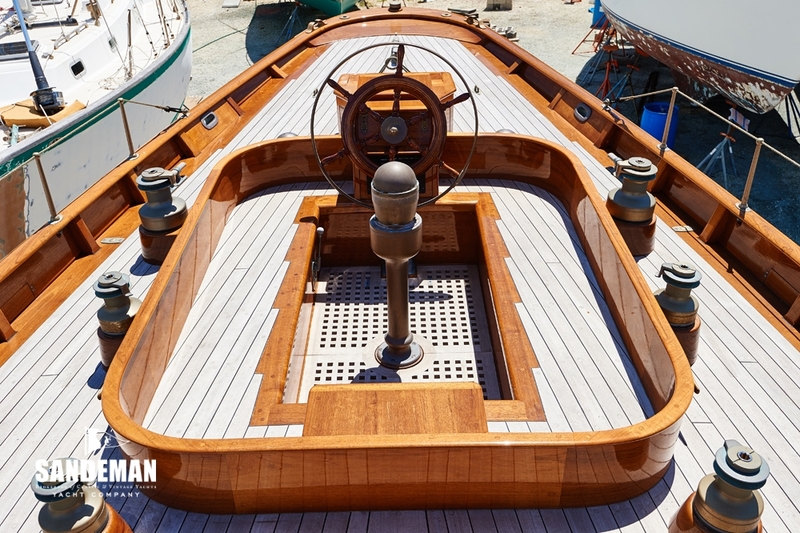 Further input, support and advice came from a host of wooden boat and system experts including Paul Goss, Tom Cunliffe, Theo Rye, Donn Costanzo, Harry Spencer, Bob Snow, Duncan Walker, Mark Ratsey, Mike Toomer, Mark Webby, Jeff Law, George Moffett, Joe Liener, Luther Goff and John Ford. 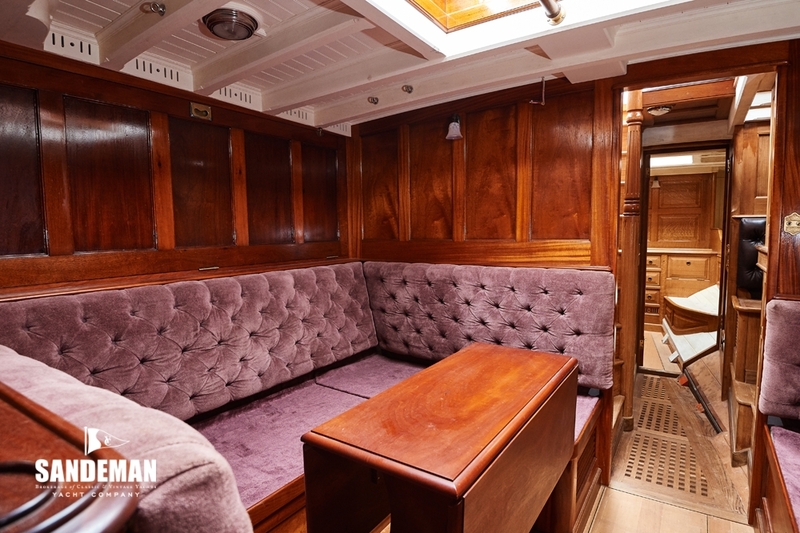 Most of this input was given free of charge because the project was so admired ! 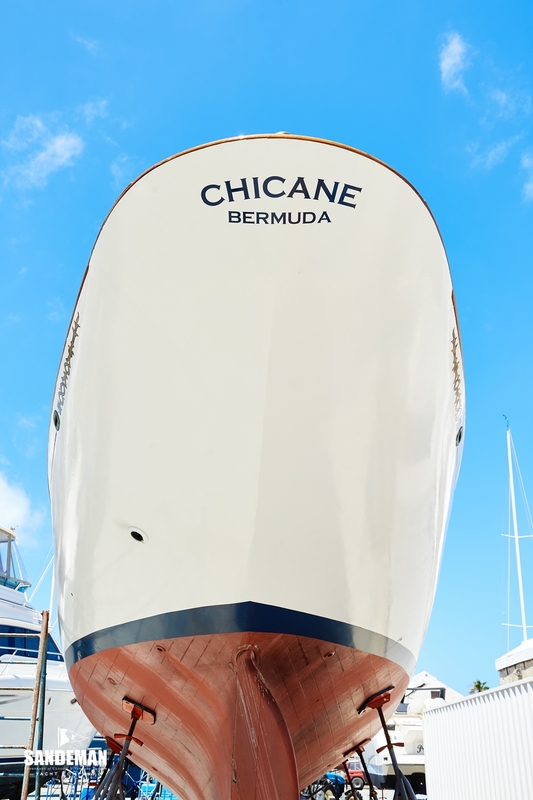 In addition to this cast, CHICANE has been visited over the years by a 'Who's Who of Yachting'; Elizabeth Meyer, Olin Stephens and Ross Gannon to mention a few. 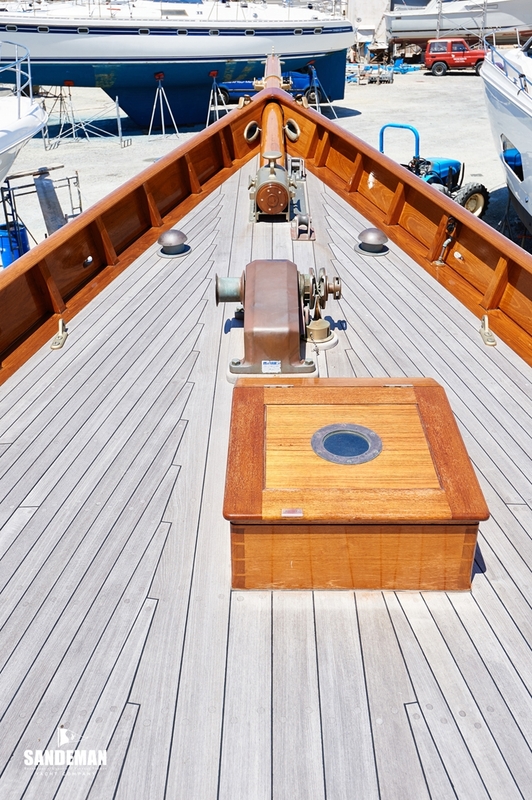 An article in WoodenBoat (July/Aug 2009) reports the legendary Olin Stevens to have stated the Chicane restoration was one of the finest he had ever seen!